The question that today’s paper seeks to answer is: can you predict the next glitch in a pulsar? In general, this is a challenging task, with different pulsars exhibiting different glitching behaviours that need to be captured in your model. However, for one particular pulsar (PSR J0537-6910) this can be accomplished fairly straightforwardly due to the strong correlation between the size of a glitch and the waiting time until the next glitch. 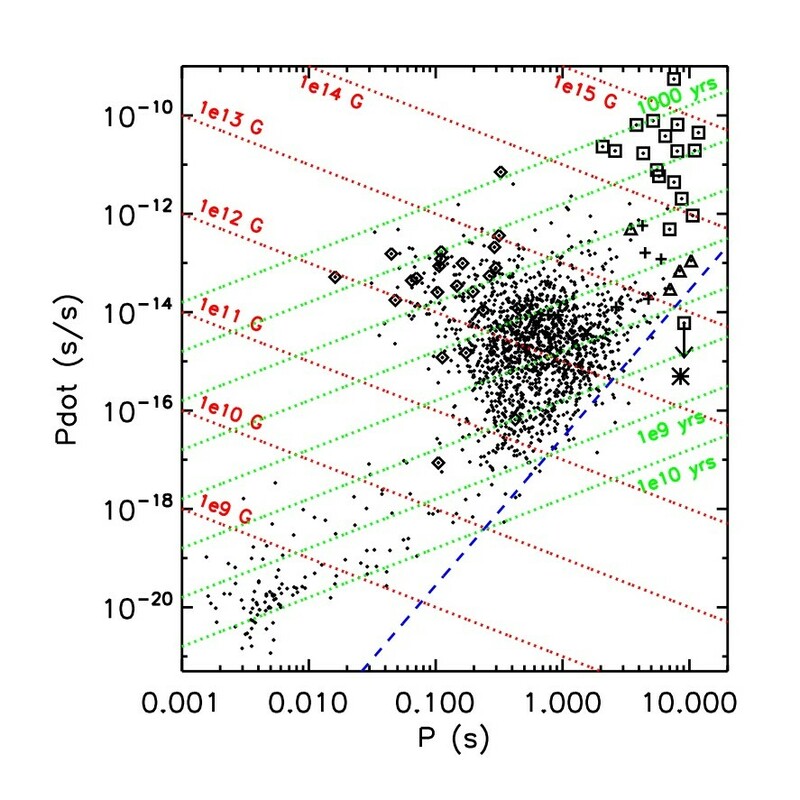 The authors of today’s paper exploit this correlation to develop a method to predict the next starquake on PSR J0537-6910. What is a pulsar glitch? Glitches are thought to be caused by superfluidity inside a neutron star. When a subtance cools down to a temperature below a critical temperature , it forms a superfluid state, i.e. a state that flows without viscosity. But neutron stars are much hotter than any substances we find on Earth ( Kelvin). So how can a neutron star be cool enough to contain a superfluid? The matter inside a neutron star is extremely dense, and has very different properties to terrestrial matter. In particular, the matter inside a neutron star has a high critical temperature Kelvin and therefore the neutron fluid inside the star can form a superfluid even at high temperatures. Figure 2: A cartoon of the angular velocity of the crust of a pulsar vs. time during a glitch. 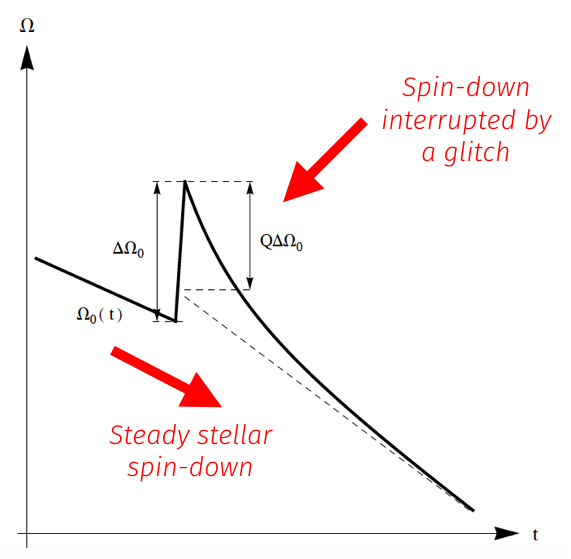 The pulsar glitch is characteristed by (1) steady spin-down of the star, (2) a step-like jump in frequency and (3) followed by an gradual relaxation back to the original spin-down rate. Figure taken from https://minerva-access.unimelb.edu.au/handle/11343/36537 and annotated in red. The pulsar spins down due to electromagnetic processes. 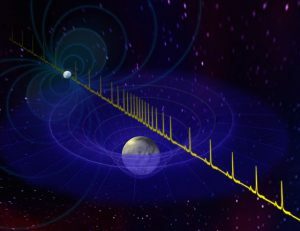 The pulsar is a rapidly rotating magnetised body – if a rotating magnetic dipole is inclined at some angle from the rotation axis, it emits magnetic dipole radiation at the rotation frequency. The emission of this electromagnetic radiation leads to lost rotational energy. Therefore, the star spins down as a consequence, and we call this magnetic braking. The crust of the neutron star spins down continuously because the magnetic field lines are locked into the crust. However, the superfluid inside the star is likely to be at least partially decoupled from the spin-down of the crust. Therefore, an angular velocity lag builds up between the crust and the superfluid as the superfluid continues to spin at the same rate for a period of time, uninhibited by the magnetic braking. Eventually, the lag builds up to a critical value. At this stage, there is an angular momentum transfer to the crust from the superfluid which causes a glitch. Because glitches are believed to be intimately connected to the behaviour of the interior superfluid, astronomers believe pulsar glitches offer a rare window into the processes occurring inside the star. It is still not known for certain exactly why and how glitches occur in neutron stars, but a number of possible mechanisms have been proposed. For example, vortex avalanches are a possible mechanism for glitches. In the superfluid, there are many vortices (i.e. tiny whirlpools) induced by the rotation of the star. Vortices are “trapped” or “pinned” to certain locations in the crust. This just means they are fixed in that location until there is enough force to unpin them. When enough lag builds up between the superfluid and the crust, the force is sufficient to unpin them. As they unpin, they transfer angular momentum to the crust and cause a glitch. Another possible mechanism is starquakes which mean there is a cracking of the neutron star crust that causes a rearrangement of the matter inside the star. Glitching pulsars can be thought of as belonging to two different classes: Crab-like and Vela-like. The Vela pulsar typically has large glitches which occur fairly periodically, while the Crab pulsar has a power law distribution of glitch sizes. Therefore, it is difficult to develop a model that captures the behaviour of these two classes simultaneously. 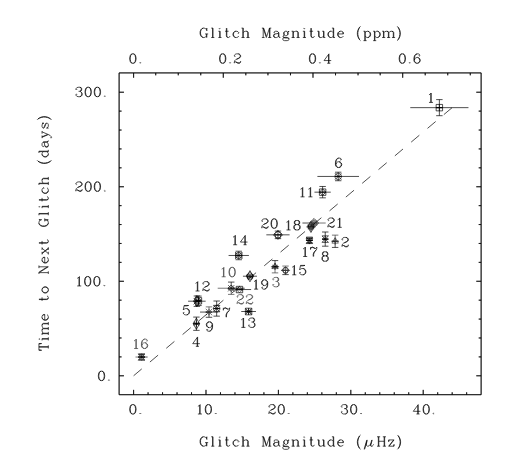 In this paper, the authors focus on a single pulsar (PSR J0537-6910) and use its unique properties to predict when it will next glitch. PSR J0537-6910 is a 62 Hz pulsar in the LMC. The authors report on seven years of observation of this pulsar, containing 23 glitches. It is unique among glitching pulsars. Firstly, it is the fastest spinning young pulsar and one of the most actively glitching pulsars we know of. Secondly, its glitching properties are particularly favourable to glitch prediction due to the very strong correlation between the waiting time from one glitch to the next and the amplitude of the first glitch, shown in Figure 3. The authors suggest the predictable behaviour of the glitches of this pulsar is associated with the the angular velocity lag build-up causing a “cracking” in the crust as glitches occur, with smaller glitches preceding a large glitch corresponding to more localised cracks. Figure 3: Waiting time vs. glitch size for PSR J0537-6910. Figure 6 in the paper. Impressively, the waiting time for PSR J0537-6910 until the next glitch can be predicted to within a few days. Predictions of this accuracy have not been achieved with any other pulsar. A Pulsar Alone Fast Radio Bursts: Shocking Neutron Stars with Black Hole Batteries Nuclear Pasta in Neutron Stars Why don’t they just break up?